Austin Air is another company that makes a serious product. All Austin Air Purifiers are manufactured in the USA - an acknowledged sign of good build quality. The Austin Air Healthmate Air Purifier hsa a 360-degree intake, contains over 60 square feet of "true medical grade HEPA" filter and includes 15 pounds of activated carbon. The company claims its 4-stage filtering system removes dust, hair, dander, mold, chemicals, gases, odors, bacteria and viruses from the air. And Austin Air backs their product with a 5 year warranty - which includes the filter parts! Austin Air Healthmate air purifiers use a 4-stage filtration process:Stage 1 is a large particle pre-filter - this removes the most easily visible such as hair and dust; Stage 2 is a medium particle pre-filter - this removes small to medium size particles such as pollen and mold; Stage 3 features 15 pounds of activated carbon / zeolite blend - this filters chemicals, gases and odors such as sulfuric acid and ammonia; finally stage 4 is 60 square feet of true medical grade HEPA - this filters bacteria, viruses and utrafine particles. The Austin Air Healthmate JR weighs 18 lbs and is 16" high x 11" x "11. 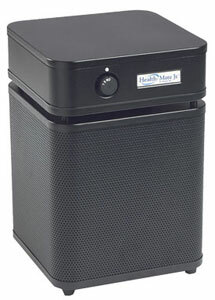 The Healthmate Jr. moves 200 cubic feet of air per minute. It is certified to remove 99.97% of particles over the size of 0.3 microns and 95% of particles over 0.1 microns. According to product reviewers (consumers), the Healthmate Jr. dramatically decreases dust in the home living environment and facilitates easier breathing. Another reviewer noted an "amazing" difference; another still said that the difference in air quality in a 440 square foot room was noticeable within an hour. The Austin units have three settings, the lowest of which is said by most to be very close to inaudible in ordinary use. Austin Air was specified by FEMA and The Red Cross to address air purification after the tragic events of 9/11/01 in New York. Austins products do not use electrostatic / ionic air purification methods and thus they state that their air purifiers produce no ozone. Austin Air's Hega Series is aimed at allergy sufferers and they claim it is the only unit on the marget to feature HEGA filtering - High Efficiency Gas Absorption. Austin Air also makes products designated for pet owners - and additionally, an intriguing air purifier product designed for babies' nurseries! In addition to cleaning the air, this machine emits a soothing "white noise" sound which apparently mimics sounds heard in the womb. White noise is a special combination of all frequencies and sounds a bit like a waterfall. White noise is widely belived to help infants sleep better and according to Austin's web site, this has now been clinically proven. Austin Air has the largest air cleaner manufacturing facility in the world, makes everything in-house, and their products are chosen by leading doctors. Austin air purifiers are guaranteed for 5 years. Austin appear to us to be a good, solid, honest American company and one worth supporting!